When you invest in College of the Ozarks students, you invest in the future of America. At Hard Work U, ® students work, rather than pay, for their education. Through the work program, students learn valuable life lessons - things like work ethic, love of country, and faith in God - all while receiving a debt-free education. Our mission and vision are central to all that we do at C of O – and we are planting seeds of success in our students’ lives. We know they will go on to do great things, to impact America in a positive way. All four students you’ll read about here are overcomers, achievers, and believers in the American dream. They understand their dreams won’t work unless they do. At a time when politicians tout their ability to provide free college education to all – we know that nothing in life is free. Our students are given the opportunity to graduate debt-free, and that is possible because of their hard work and your generosity. Each donation acts as a partial scholarship to our students, and helps them grow in amazing ways. If you make a donation today – we’ll send a packet of zinnia seeds to you – hand-packed by our landscaping students for your enjoyment. 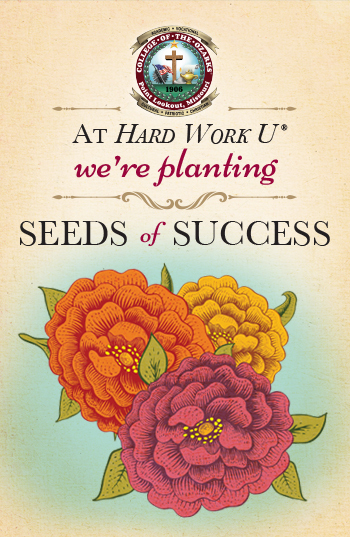 As these seeds grow, we hope you remember all the seeds of success we’re planting here at the College. Will you join us in our endeavors and send whatever gift you can? Whether $20, $50, $100 or more – every gift makes a difference in the lives of our students. Thank you for investing in our students and the future of our great nation. and receive a pack C of O zinnia seeds!